A few weeks ago I attended a class with Marie Simmons at the Whole Foods near me. She’s the author of dozens of cookbooks, and the most recent one, which she was in town to promote, is Fresh & Fast Vegetarian. As she explained early on, it’s hard to make “fast” vegetarian food, especially when it’s “fresh,” because of all the chopping and cleaning. This is something I’ve been slow to publicly acknowledge about vegetarian cooking, lest it deter anyone from the kitchen. But she decided to use the challenge as the basis of her book. 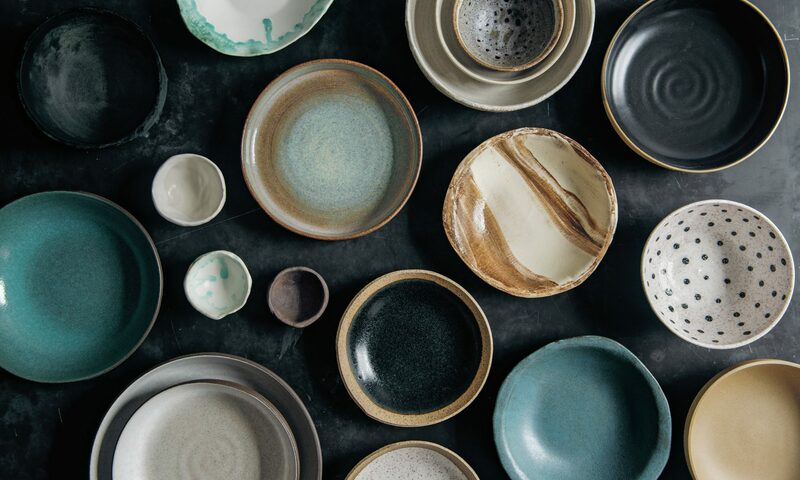 Marie Simmons has a bubbly persona and her attention seems to zip around like a humming bird, which, combined with her undeniable authority (James Beard and IACP Awards, a Bon Appétit column to her name, among many other accomplishments), makes her a lot of fun. As the Whole Foods organizer of the event put it, she’s “the gold star of cookbook authors,” and in that vein Fresh and Fast Vegetarian doesn’t disappoint. So it’s funny, I guess, that in the end the recipe I zeroed in on was this one, which is more of an aside in the introductory chapter than a standalone recipe. I love glazed nuts, especially the idea of having a crystal bowl of them out on the end table to pick at all day like my grandmother did. Here the nuts are made entirely in a skillet on the stove—no separate oven-roasting or sugar-melting—and then the glaze is made of agave nectar, something that seems innovative to me. I tweaked things a little bit by adding a spice profile, but leave the thyme and cayenne out if you’d like to keep things pure. There’s a lot of room for improvisation here. Walnuts or pecans would be great in place of the almonds. Or instead of the thyme-cayenne flavors, a thick coating of toasted sesame seeds would be good, or just a sprinkling of rosemary and sea salt. 1. 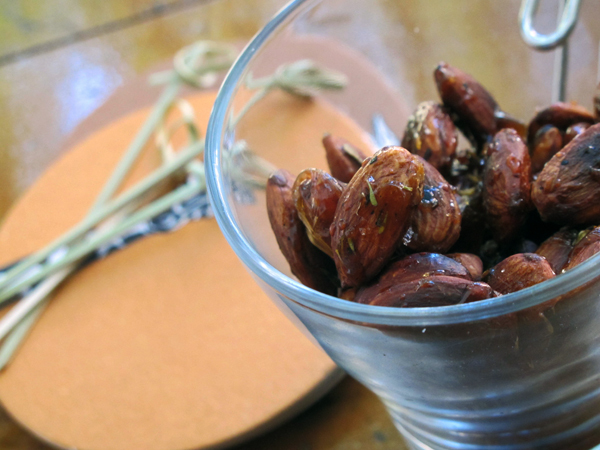 If using raw almonds: Place them in a dry skillet over medium-low heat and toast for 20 to 30 minutes, until darkened a shade and uniformly browned on the interior (slice one in half to check). Turn the heat up to medium and add the oil to the pan, stirring to coat. 1a. 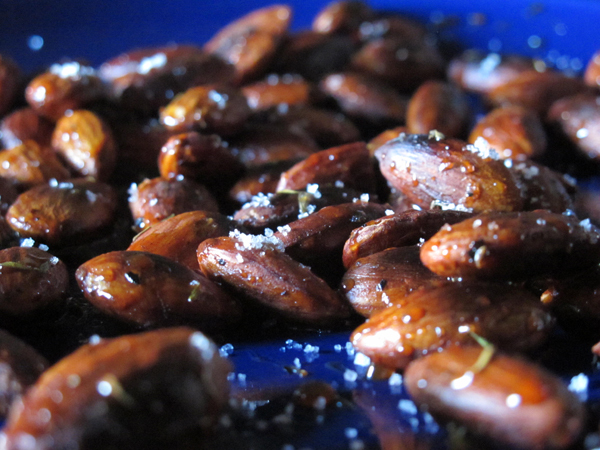 If using roasted almonds: Heat the oil in a skillet over medium heat. Add the almonds and stir to coat. Heat for 1 minute or so, until just fragrant. 2. Very lightly grease a plate or baking sheet and set it aside. Measure the agave into a small bowl so that you can add to the pan in a single shot. 3. 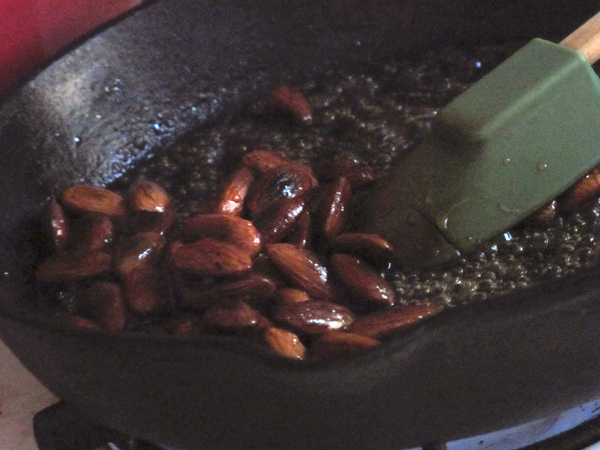 Increase the heat to high and heat for 1 minute, stirring or swirling the pan so as to prevent the almonds from burning. Pour in the agave and stir. Continue cooking for 1 to 2 minutes, until the syrup has darkened a few shades and the bubbling has reduced. Off the heat, rub the thyme between your palms and sprinkle it over the nuts, then toss in the cayenne. Give the pan a stir, then quickly transfer the contents of the pan to the greased plate or baking sheet. Sprinkle with salt, then allow to cool completely and harden, which will take about a half hour. This is a great little snack, I’ll have to try it. Sounds like a fun class you took. I really think the term “fast” is relative. I am a vegetarian who makes unprocessed foods, and I think it’s time well spent (tho I do what I can to speed the process). I try to chop in advance where I can, or make in a few steps then pop in the oven the next day, etc.